When ultra-thin transparent varnishes are applied onto transparent foil tapes, defects in the coating can now be made visible immediately during the coating process. This is possible thanks to an inline detection system that uses fluorescence dyes. The ultra-barrier film, developed by the Fraunhofer Alliance POLO®, must meet the highest standards for the encapsulation of organic light-emitting diodes or solar cells. It protects the sensitive organic materials for years from oxygen and water vapour. The film has to be thin and transparent. 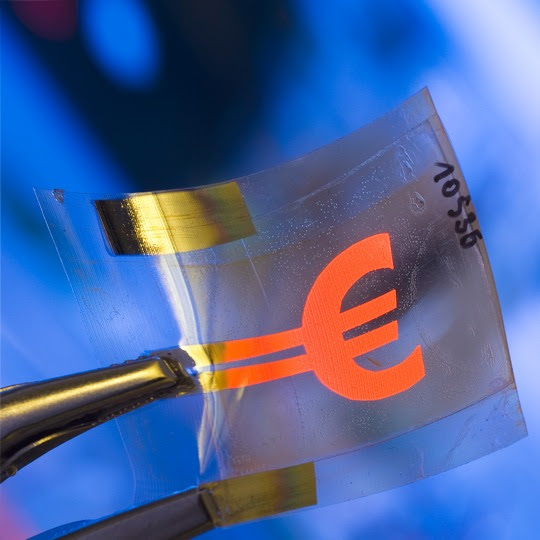 An important layer for the barrier properties – an extremely thin varnish – consists of a hybrid polymer (ORMOCER®) developed by the Fraunhofer ISC. The varnish layer has to be precisely the same thickness all over and be less than one micron. The Fraunhofer Institutes for Applied Polymer Research IAP in Potsdam, for Process Engineering and Packaging IVV in Freising, and for Silicate Research ISC in Würzburg have developed an inline detection system that makes this possible. The transparent barrier varnish consists of the hybrid polymer ORMOCER® developed by the Fraunhofer ISC. It is applied to a transparent film using a roll-to-roll technique. »Both materials, varnish and film, have a very similar refractive index. This makes it challenging to determine the coating thickness, particularly since the varnish is applied as a very thin layer,« explains Dr. Andreas Holländer, spokesman for the Fraunhofer Alliance POLO® and surface specialist at the Fraunhofer IAP. The researchers have discovered a clever solution: They mix a small amount of a fluorescing organic dye into the ORMOCER® varnish. Its concentration is around 0.001 per cent. The dye absorbs light of a specific wavelength and emits light of another wavelength, in other words in another colour. Even the smallest concentrations of the dye can be detected. In the case of several fluorescent dyes the neighbouring molecules are able to influence the intensity of the wavelength of the transmitted light. For example, the curing of the varnish layer can lead to a stronger fluorescence signal. When such dyes are combined, information can be obtained about the thickness distribution and the curing degree of the coating. When applying the ORMOCER® varnish, the detection system is integrated into the roll-to-roll process at the Fraunhofer IVV, producing an ultra-barrier film. Two types of monochromatic LED lamps shine onto the varnish. Two commercially available digital cameras measure the fluorescence emitted from the two dyes in the varnish. »The dyes determine, for example, the type of light source or the filters,« says Holländer, who developed the dye/camera system at the Fraunhofer IAP. »The dyes also have to be soluble within the coating system. Their optical properties may not overlap with those in the coating itself,« Holländer explains. With the aid of electronic imaging, defects in the coating layer can now be made visible immediately and the coating process can be adjusted quickly and precisely. In the past such defects weren’t visible until the product was in use and sometimes only evident by the OLED’s short lifespan. Now, thanks to the new system, a loss of image and additional costs as a result of recalls or complaints can be avoided. The dyes are added in such low concentrations that they cannot be chemically analysed. As a result, researchers are also using the principle to protect materials from plagiarism. »If you are unable to establish which dyes are in it, it is much harder to copy the marking,« says Holländer. »There are several thousand commercially available fluorescent dyes that can be combined with one another. This results in a myriad of different variations. When mass-produced plastic or expensive materials like lubricants are marked with it, they can be tested for authenticity using their own type of fluorescent code,« the IAP scientist explains. Thanks to its simple set-up, the fluorescence-based inline imaging system can easily be integrated into existing processes. The system will also be commercially available in the future. The researchers will present this innovation at the K 2016, the leading trade fair for the plastics and rubber industries, from 19 – 26 October in Dusseldorf in Halle 07 at the joint Fraunhofer booth SC01. The Fraunhofer Polymer Surfaces Alliance POLO® bundles the individual competencies of seven Fraunhofer institute and develops innovative concepts, technologies and materials for the functionalisation of polymer surfaces. The POLO® institutes have extensive methods for characterising and analysing polymer materials, surfaces, interfaces and thin layers. The technical facilities for surface coating and modification are some of the most state-of-the-art in the world.